What areas will my tutor help me with? What is the process of getting a tutor? Will I get answers from my tutor? Is there any specific time I could access your website? What should I do to rehire my favorite tutor? Is this possible? Is it possible to review my previous sessions? Do you have a minimum time per session? How can I contact customer service assistance? How long is the average tutoring session your company offers? Our process is pretty simple. If you are in need of assistance in any of your subjects - math, languages, science, or any other - we have thousands of professionals ready to accommodate you. We ensure that there will always be tutors on every subject on standby so that your convenience will be guaranteed. Every tutoring session is conducted in our virtual classroom. All you need is a stable internet connection and you'll be good to go. We employ tutors specializing in various academic disciplines. They are qualified to help you in your various paper works such as essays, research papers, and the like. They can also review you for upcoming examinations and rehash the discussions you had in class. Ensuring your convenience is our priority. Getting a tutor is easy. Just register to our site and choose the tutoring package you deem fit for your needs. 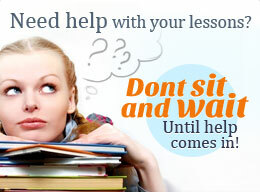 Request for a lesson and get a tutor to assist you immediately. We do not provide you your schedule so that you won’t feel bound up. However, please keep in mind that your specified session will start on time, so we advise you to choose the schedule convenient to you to avoid missed lessons. More than giving you answers, our tutors will teach you how to arrive at the answers correctly on your own to ensure proper learning. Spoon-feeding the answers will only get you so far, but with us, we make sure that our tutors really teach you and set you up for the future. Completing a tutoring session with us will make you more knowledgeable and confident in your skills in the subject you sought help with. Our services are available at any time of any day most convenient to you. You can get professional assistance 24/7. Of course, you can work with the same tutor. However, if in case your chosen tutor is not available, you can either get in line or choose another tutor. Don't worry; all our tutors are competent and are happy to give you the help you need. If you wish to get the services of your favorite tutor again, just indicate this in the preferred tutor field. If you wish to review previous sessions, just check this option on your personal account. We do not bind you to a strict schedule, so you are free to use the minutes on your package as you wish. It all really depends on how much time you want to spend on a particular session. We make sure that all our hired tutors have enough knowledge to cover any topics and answer any questions in their respective academic specializations. Moreover, they only choose sessions they are 100% confident of covering completely. However, if you take part in a tutoring session that falls below your expectation, request a credit from us and we'll investigate the matter further. Our contact details are provided on our website's contact us page. You can reach our Customer Support agents at any time the need arises. Although we give you total freedom in allotting your specified time per tutoring session, we strictly enforce a minimum length of 15 minutes. Anyway, it is not really advisable for you to book a session shorter than this because, quite frankly, nothing can be accomplished in such short time span. If you just need quick consultations regarding certain subjects in school, then our minimum is perfect for you. We normally offer tutoring sessions spanning an hour. This amount of time is the most ideal in having all your concerns covered. Anything longer than a two-hour session is not permitted by the company, mostly for the reason that it is counterproductive. Tutoring sessions that are longer than two hours tend to be dragging, and you might lose interest in the lesson. Should you wish to have longer sessions, we advise you to order several lessons.